The ORA System is a brand new technology that will revolutionize how surgeons give custom care to their patients. This new technology will allow surgeons to monitor and accurately tailor the cataract operation specifically to your eyes. Having a more accurate representation of your own unique eye will yield the best results possible! The ORA System™ utilizes intraoperative wavefront aberrometer, similar to the technology that has made LASIK a customized, precise procedure. A low-intensity beam of laser light is directed into the eye. The laser light reflects off the patient’s retina and sensors in the aberrometer measure optical characteristics in the reflected light. This gives the surgeon the ability to see the unique structure of your eyes. 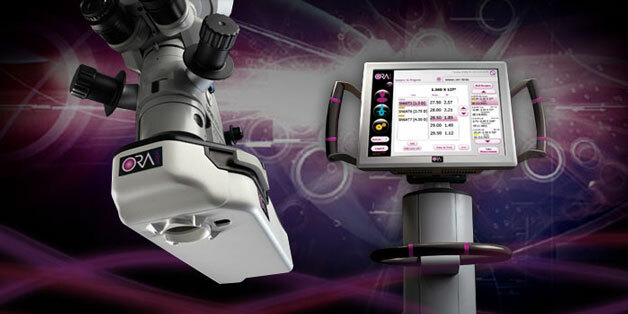 It gives the surgeon an accurate, real-time measurement of the eye’s focusing capabilities at any time during surgery. This helps your surgeon choose the best intraocular lens power and astigmatism correction. Thus giving the patient the best possible results. It truly is revolutionary and the difference is clear.